Removable aligners straighten your teeth – A new aligner is used every one to two weeks with occasional checkups at our Walnut Creek office. Aesthetic Appeal – Clear aligners are a popular option for adults who want to correct their teeth without a metallic smile. Customized to fit and move your teeth with less discomfort – The series of aligners are designed to advance treatment every one to two weeks. Easy to maintain brushing and flossing – Simply remove aligners for cleaning ease. Freedom to eat and drink whatever you want – Remove aligners before eating (place aligners safely to the side to avoid misplacement). Smooth alignment Clear aligners are designed to fit closely and comfortably — their smooth contours won’t scrape or cut the inside of your mouth. – Invisalign® and 3M Unitek use BPA free plastic in the aligners. Timesaving system requires fewer office visits – The treatment plan is designed at the initial visit. Dr. Erdell will create the series of aligners and less visits compared to treatment with braces are required to track progress. Price is little more than braces. Effective way to achieve a healthy, beautiful smile at any age! 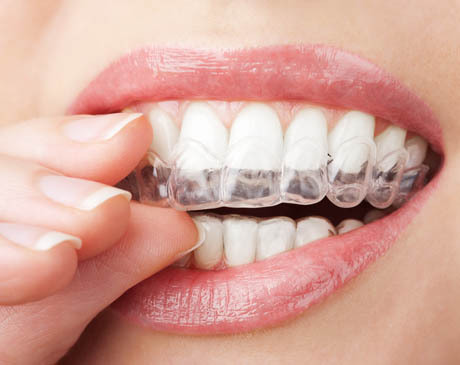 As an experienced orthodontist, Dr. Erdell has treated patients with clear aligners since 2001! What does clear aligner treatment involve? First, Dr. Erdell performs a thorough examination. A 3-dimensional scan, photographs and x-ray images are taken of the entire jaw and mouth area. With this information, Dr. Erdell creates a detailed treatment plan that specifies which teeth should be moved at each stage for safe tooth movement and desirable results. Following her instructions, Invisalign or 3M Unitek will manufacture a series of custom aligners using 3D computer imaging. During the period that you wear each aligner, it incrementally moves specific teeth until you are ready for the next one in the series. The process continues as you advance from one aligner to the next until you finish with the final aligner and complete the procedure. Total treatment time varies between six to 24 months, with office visits every six to 10 weeks to ensure that your treatment is progressing as planned. Life with aligners aligning trays may take several weeks to get used to. The trays should be worn constantly, except when eating and drinking. It is important to remove the trays when consuming food or drink because food can become trapped between the tray and teeth, causing tooth decay or potential damage to the aligners themselves. In most aligner cases, new trays are necessary every one to two weeks. Progress is clearly visible by the naked eye between visits. Walnut Creek Invisalign Provider, Dr. Erdell is renowned for treating guests comfortably and effectively. Located in Walnut Creek, we are honored to serve patients from the surrounding area including Concord, Clayton, Lafayette, Pleasant Hill, Alamo and more. If you have questions about Invisalign® Clear Aligners, please contact our office for a complimentary consultation call today. It’s time to makeover your smile with the aesthetic look and gentle treatment clear aligners in Walnut Creek.